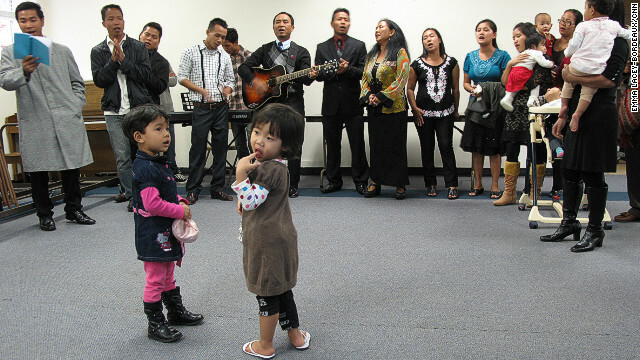 Burmese refugees gather and sing after church in Decatur, Georiga. (CNN) – On Monday President Barack Obama will become the first sitting U.S. president to visit Myanmar. The trip comes nearly a year after Secretary of State Hillary Clinton visited with a pledge of better relations if the country made democratic reforms. Obama’s trip comes after historic elections earlier this year. Among those closely watching this trip are ten Burmese refugee families in Decatur, Georgia. The families gathered together on a recent Sunday at their church to share their thoughts about this trip. Loro Puia has been in the United States for five years. He shared his feelings through a translator. [2:20] "We are very grateful to Obama who is the father of a great nation who is going to visit the poorest country in the world." Puia and the others said they fled their country in recent years because of crippling poverty but also because, until very recently, the country was under the harsh rule of the military. Hzir Tluangpuii left Myanmar in 2007. From afar she's seen changes in her homeland but recalls a tough life. [3:21] "We are under the military so that means we are under their force. Whatever they say we have to do." [4:43] "I still have my parents in there and now my mom is really sick. My mom is really sick and I can't see my mom." That's why they have high hopes for Obama's trip and, until their country changes, reunions are on hold.